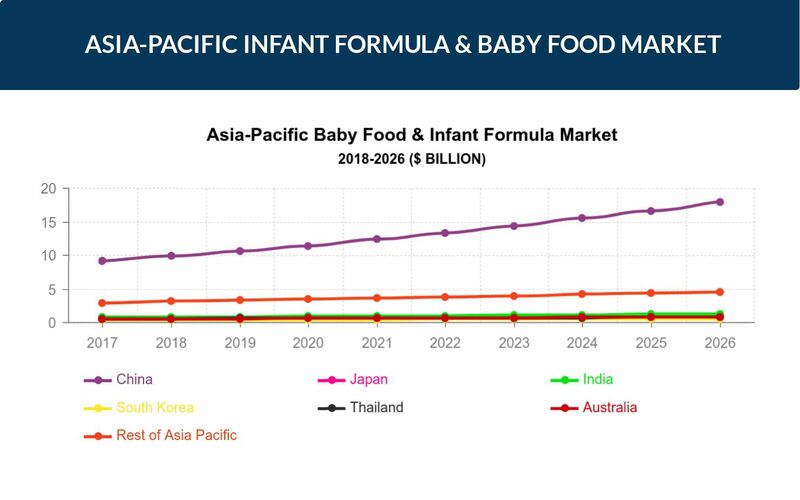 Asia Pacific Infant Formula & Baby Food Market was valued to be at $14.51 billion in 2017. The market is likely to reach $26.41 billion by 2026, due to an estimated CAGR of 6.88% during the forecast period of 2018-2026. Asia Pacific is one of the fastest growing markets for Baby Foods. A massive population base and rapid urbanization in the region are major propellers for this region. Asia Pacific infant formula & baby food market was valued to be at $14.51 billion in 2017. The market is likely to reach $26.41 billion by 2026, due to an estimated CAGR of 6.88% during the forecast period of 2018-2026. The Asia Pacific is one of the fastest growing regions for infant formula & baby food market. A massive population base and rapid urbanization in the region are major propellers for this region. Several specialized online stores, including FirstCry.com and BabyOye, are also fueling the sales of infant formula & baby Food in this region. The China infant formula & baby food market is expected to register the highest CAGR over the forecast period for this region. Recently, China has relaxed its one-child policy, resulting in increased birth rates, giving a significant concession for the infant formula & baby food and infant formula market to expand in this region. Other significant APAC markets that are covered in this report include India, Japan, South Korea, Thailand, Australia and the rest of Asia-Pacific. Some of the major players in this region include Mead Johnson Nutrition Company, Baby Gourmet Foods Inc, The Hain Celestial Group Inc, Abbott Nutrition, Gerber Products Company, The Kraft Heinz Company, Nestle SA, Danone SA, Beech-Nut Nutrition Corporation, Morinaga Milk Industry Co Ltd, Hero Ag, and Perrigo Company PLC.